After much delay and several changes to the cover art while being listed on Amazon, this book is finally out. This 392-page hardcover is a large book to behold. In the introduction it says that this project was initiated by Alex Ross and his contribution is for art direction. Chris Lawrence is the author and does a respectable job dealing with this mammoth of a topic. 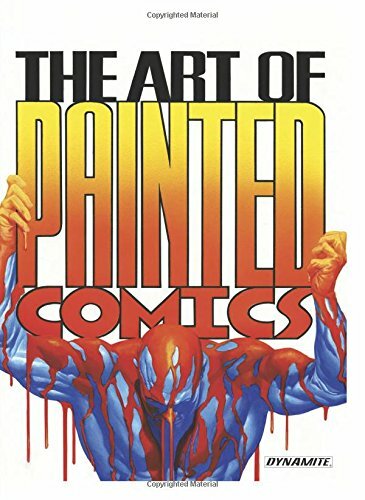 Right at the beginning, a disclaimer says that this is "a history of painted comics rather than the history of painted comics". I can see how that is necessary given the scope and undertaking, it's quite impossible to include everything. I'm not knowledgeable about comic history so I can't really comment much on the writeup. There are reviewers on Amazon who questioned the research and content included and left out. I do enjoy the text. There are also specific artists and publishers being highlighted. You can read about how art influenced comics and also the influence of artists on other artists. Towards the end of the book there many profiles of comic artists now working in the industry. As a coffee table artbook, it's fantastic. The book is packed with lots of wonderful artworks. Check out more reviews on Amazon.